My new friend Johnny from many places. Johnny and some other runners from Arizona and LA just joined us a few days earlier. This is us taking a ferry towards Port Townsend. 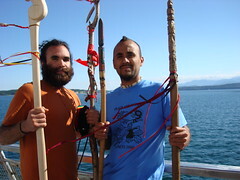 We carried the staffs across the water to meet with the coastal tribes along the Washington coast. This picture makes me smile. for many reasons this picture makes me smile.